Green Graffiti : Raise Your Voice! Of the many commemorative days that dot our calendars, 5th June – World Environment Day – is probably one of the most significant. 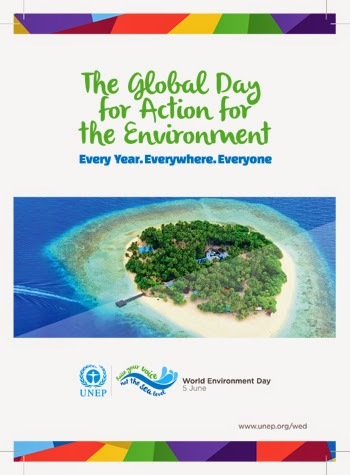 Promoted by the United Nations Environment Programme (UNEP), the World Environment Day (WED) is the UN’s chief annual event for spreading awareness and inviting action with regard to issues concerning the environment. The theme for WED 2014 focuses on Small Islands and the impact of Climate Change on them. The official slogan for this year’s event is 'Raise Your Voice, Not The Sea Level’. This theme is an invitation for global action to combat climate change which, as we know, is causing a rise in sea levels and consequently posing a threat to people living in coastal areas and especially on small islands. This theme is extremely timely given the fact that we have already begun experiencing the disastrous effects of rising sea levels. Just recently the news channels reported that the Carteret Islanders of Papua New Guinea have become the world’s first entire community to be displaced by climate change. They are the first official refugees of global warming. The 2000 inhabitants of this small island have been forced to desert their home because of the ever-rising waters that threaten to overtake their homes and crops. This island, that has been their home for generations, will be totally submerged by 2015! Well, this is but the first such community to be displaced because of climate change – the writing on the wall prophesies that many more are to follow! According to scientific estimations and environmentalists’ predictions, there could be between 150 to 200 million climate change refugees by 2050. And so, as the WED 2014 theme says, it is time to raise our voices, to be part of the worldwide movement that is fighting against the causes of global warming. For a start, look around your neighbourhood, identify organizations or campaigns that are engaged in these issues and lend them your support. The seas may be rising, but if we can put together an ocean of committed environmental activists, we definitely can turn the tide!